Nick Heath on the wave of rebellions and uprisings of rank-and-file Russian workers and peasants across the country in 1919-1921 against the Bolsheviks, who were consolidating their grip on power. Contrary to the Bolsheviks' claims, these rebellions were not reactionary but in fact in support of the original aims of the revolution: socialism, and workers' and peasants' self-management. Taken together they can be referred to as a Third Revolution. During the Civil War in Russia, Lenin's government was faced with a number of predominantly peasant uprisings which threatened to topple the regime. Can the accusation be justified that these were led by kulaks (rich peasants), backed by White reaction, with the support of the poorer peasants, unconscious of their real class interests? Or was it, as some opponents of Bolshevism to its left claimed, the start of the 'Third Revolution'? "All those who really take the social revolution to heart must deplore that fatal separation that exists between the proletariat of the towns and the countryside. All their efforts must be directed to destroying it, because we must all be conscious of this - that as much as the workers of the land, the peasants, have not given a hand to the workers of the town, for a common revolutionary action, all the revolutionary efforts of the towns will be condemned to inevitable fiascos. The whole revolutionary question is there; it must be resolved, or else perish"
- Bakunin, from The Complete Works "On German PanGermanism". Orthodox Marxism discounted the revolutionary role of the peasantry. According to the German Marxist Karl Kautsky, the small peasant was doomed. It was tactically useful to mobilise the peasant masses. In his the Agrarian Question, he stated that the short-term objectives of the peasants and the lower middle class, not to mention the bourgeoisie, were in opposition to the interest of all humanity as embodied in the idea of socialist society. "When the proletariat [meaning the industrial working class] comes to try and exploit the achievements of the revolution, its allies-the peasantry- will certainly turn against it...the political make-up of the peasantry disbars it from any active or independent role and prevents it from achieving its own class representation...By nature it is bourgeois and shows its reactionary essence clearly in certain fields... That is why the proposition before the congress speaks of the dictatorship of the proletariat alone supported by the peasantry... Peasantry must assist proletariat, not the proletariat the peasantry in the achievement of the latter's wishes". Leo Jogiches, "The dictatorship of the proletariat supported by the peasantry"at the Sixth Party Congress of the Polish Social Democrats 1908. (and the following discussion at the Congress where it was stated that the "peasantry cannot play the autonomous role alongside the proletariat which the Bolsheviks have ascribed to it". Rosa Luxemburg shared Jogiches' mistrust of the peasantry, and could see them only as a reactionary force. Lenin himself, extremely flexible on a tactical level, and extremely rigid on an ideological level, was conscious of what he was doing when his Party advanced the slogan of the dictatorship of the proletariat and peasantry. After Bolshevik triumph "then it would be ridiculous to speak of the unity of will of the proletariat and of the peasantry, of democratic rule...Then we shall have to think of the socialist, of the proletarian dictatorship"(Two Tactics of Social Democracy in the Democratic Revolution, 1905). For his part Trotsky had a harsher attitude to the peasantry, and was unconvinced of even a temporary alliance with them: "The proletariat will come into conflict not only with the bourgeois groups which supported the proletariat during the first stage of the revolutionary struggle, but also with the broad masses of the peasants (1905,written in 1922). The Bolsheviks defined 'kulaks' as rich peasants, able to sell produce on the market as well as produce for their own use, able to employ hired labour and to sell their surplus products. They were seen as representing the real petit bourgeois elements in the countryside, ready to develop agriculture through capitalist advances. In the second stage of the revolution, after the initial bourgeois stage, the kulaks (and a 'substantial part of the middle peasantry'-Lenin) would go over to the bourgeoisie, whilst the proletariat would rally the poor peasantry to it. But as Ferro points out: "The search for the kulak was partly false, a matter of chasing shadows, for the kulaks had often disappeared, or sunk to muzhik level, since the Revolution of October". What is certain is that on a practical level the Bolsheviks alienated vast masses of the peasantry in the 'War Communism' years from 1918 to 1921, in particular with grain requisitioning and the Chekist repression. The Bolsheviks sought to bring class war to the peasantry. In doing so they exaggerated the importance and wealth of the kulaks. Selunskaia reports that in fact only 2 per cent could be classified as 'clearly kulaks'. One official statistic gives the following figures: in 1917, 71% of the peasants cultivated less than 4 hectares, 25% had between 4 and 10 hectares, only 3.7% had more than 10 hectares, these categories changing respectively in 1920 to 85, 15, and 0.5%. Another criterion, the possession of a horse, according to the same statistics, can be used to show relative wealth.29% had none, 49% had one, 17% had two, and 4.8% had more than 3 (in 1917). By 1920, the figures had changed respectively to 27.6, 63.6, 7.9, and 0.9%. In fact, the number of kulaks- and here we are referring to Bolshevik norms as to what constituted 'wealthy'- was diminishing, and the equalisation process was continuing. As for the requisitioning, the leading Bolshevik Kubanin admitted that half the food collected rotted, and many cattle died on railway carriages en route, due to lack of water and food. In reaction to war communism, a number of insurrections broke out. In the East Ukraine, the Makhnovist movement, inspired and militarily led by the anarchist peasant Nestor Makhno, was one of the more ideologically developed movements. It must be remembered that the Makhnovists had controlled this part of the Ukraine before the arrival of the Red Army and had successively defeated Austro-German and White troops. The Makhnovists invited a number of anarchists fleeing from the North and Bolshevik persecution or returning from foreign exile, to work through the Nabat (Alarm) Confederation of Anarchists in propaganda, cultural and educational work among the peasantry. The Makhnovists saw the White threat as a greater danger than the Bolsheviks, and concluded a series of alliances with the latter in a united front against the White leaders, Denikin and Wrangel. In fact, there seems to be much evidence that Wrangel would have smashed through the Ukraine and taken Moscow and destroyed the Bolshevik government, if not for the efforts of the Makhnovists. At the end of a joint campaign against the Whites in the Crimea, Makhnovist commanders were invited to Red Army headquarters and summarily shot. Makhno himself fought on for several months, before being forced to retire over the border . The Cheka and the prodrazverstksa (food requisition squads) never showed themselves in the Makhnovist centre of Hulyai-Polye before 1919, but peasants living in the Ekaterinoslav and Alexandrovsk areas had plenty of experience of them. In other areas of insurrection the initial opposition was more directly a result of the 'War Communism' policies of Bolshevism. In West Siberia, (and indeed throughout the whole of Siberia - see [URL= http://libcom.org/history/1900-1923-anarchism-in-siberia] our article A Siberian Makhnovschina[/URL]) the regime was faced with probably their worst threat, and it is possible that it was this, more than the Kronstadt insurrection of the same year, that forced it to change course. Krasnaya Armiya (Red Army, published by the Military Academy, and aimed at a small circle of Communist readers) had to admit in its edition of December 1921 that the carrying out of the grain collections in spring 1920 roused the Siberian peasantry against the Communists and that "the movement in the Ishimsk region was proceeding under the same slogans which at one time were put forth by the Kronstadt sailors". Red Army had to admit that ineptitude, economic mismanagement and 'criminal' seizure of property had been amongst the causes of peasant dissatisfaction. The journal recognised the effect on the morale when they saw at first hand the food requisitioned from them rotting in carloads. 'Provocatory acts' by government representatives in the tax-gathering agencies had frequently brought about risings of entire villages. The journal also reported on 'a very unique' movement in the Don and Kuban regions, headed by Maslakov, an ex-Commander of the Red Army, with the aim of declaring war on "the saboteurs of the Soviet power, on the 'commissar-minded' Communists". In fact, this was a whole brigade of the Red Army. Indeed Maslakov's uprising in February 1921 in eastern Ukraine quickly linked with the Makhnovists through the detachment of the Makhnovist commander Brova. 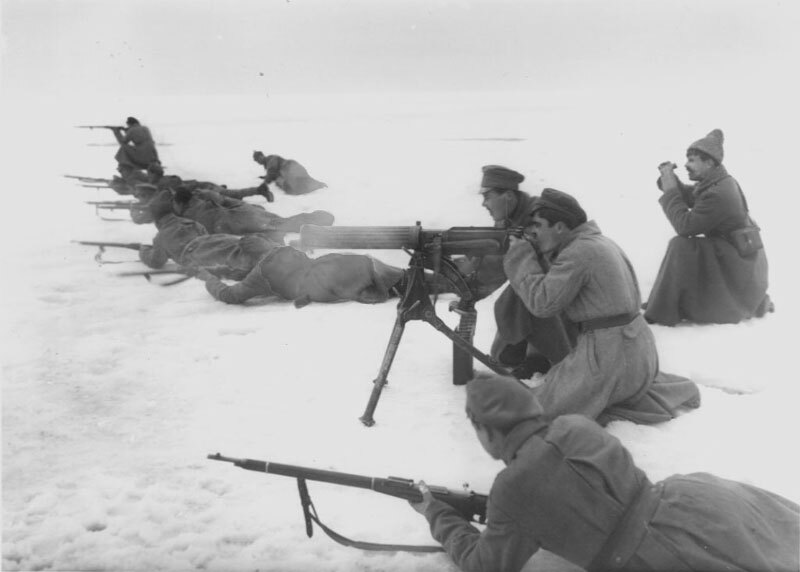 Red Army Commanders revolted, as with the battalion at Mikhailovka led by Vakulin, and then Popov, in the Northern Don Cossack territory (from December 1920) Vakulin appears to have had a force of 3,200 - six times the amount he had started out with - when he moved east into the Ural region. He succeeded in taking prisoner a Red Army force of 800. But on 17th February 1921 he lost a battle in which he died, and the Don Cossack F.Popov, a Socialist Revolutionary, took over. The Popov group moved back into Samara and then Saratov provinces, picking up strength as it went along. It was estimated by the Red Army that it numbered 6,000 by now. It managed to capture an entire Red Army battalion. It appears to have been eventually crushed, if we believe Bolshevik sources. In Samara a Left-Social Revolutionary officer, Sapozhkov, in the Red Army revolted at the head of 'anarchistic and SR elements' (according to the Soviet historian Trifonov). He was himself the son of a peasant in this province. This uprising began on 14th or 15th July 1920 with a force of 2,700. Sapozhkov fell in battle on 6th September after 2 months of fighting. His place was taken by Serov, who was still able to gather 3,000 combatants and who fought on until summer of 1923, the longest time than any rebel band had fought on, apart from Makhno. In the Tambov region another serious insurrection began in August 1920 under the guidance of Alexander Stepanovitch Antonov. Here again the revolt was sparked off by grain requisition. Antonov himself was an ex-Social Revolutionary, and then Left SR, who spoke of defending both workers and peasants against Bolsheviks. Other leading lights in this movement included, Socialist Revolutionaries, Left Socialist Revolutionaries and anarchists. The Antonovists were able to assemble 21,000 combatants at one time. The anarchist Yaryzhka commanded a detachment of the Antonovist movement under the black flag of anarchism. Whilst serving in the Army during World War I he had struck an officer in 1916, been imprisoned and had converted to anarchism as a result of his experiences. He began operations in autumn 1918, fighting on till he was killed in action by the Bolsheviks in autumn 1920. It can be seen that all these risings or oppositional movements to Leninism amongst the peasantry occurred around about the same time, over the period 1920-1921. Indeed, taken with the rising of the sailors at Kronstadt in 1921, they formed in toto a grave threat to Bolshevik rule. The aims of the Kronstadt insurgents seem to have had an echo in the peasant movements. This is hardly surprising considering many Kronstadt sailors had peasant origins. The west Siberia uprising adopted the Kronstadt demands[6A], as noted by Krasnaya Armiya. After the Tambov insurrection, the Soviet authorities found the Kronstadt resolutions at an important Antonovist hiding place. Antonov himself was so saddened by the news of the crushing of the Kronstadt uprising that he went on a vodka binge, so it is alleged. It appears that some Kronstadt sailors escaped the crushing of the insurrection and linking up with the Antonovschina. On 11th July Bolshevik cavalry fought an engagement with a small but elite band of Antonovists, Socialist-Revolutionary political workers and sailors. They fought with "striking steadfastness" until the end according to the Chekist Smirnov, when the few survivors shot first their horses and then themselves. One Bolshevik noted in 1921 that "the anarchist-Makhnovists in the Ukraine reprinted the appeal of the Kronstadters, and in general did not hide their sympathy for them." It is clear that the Kronstadters were opposed to Tsarist restoration, and had been instrumental in bringing down the Kerensky regime. The Makhnovists were equally implacable towards the Whites. No alliance was even considered with them against the Bolsheviks, and indeed the Makhnovists formed anti-White alliances with the Bolsheviks, the last of which was to prove their downfall, as seen above. The movement was deeply influenced by anarchism, and hardly likely to countenance collaboration with one of its mortal foes. As for Maslakov, he had been a trusted Red Commander, and seems to have been fighting for a communism without commissars. Krasnaya Armiya admitted that the insurgents in the Don and Kuban regions 'disapprove of and fight against White Guardist agitation'. As for Antonov, he "undertook no embarrassing action against the Bolsheviks such as cutting communications behind the front lines, but contented himself with combating punitive detachments sent out against the peasants". Antonov had been imprisoned under Tsarism for his activities as a Socialist Revolutionary during and after the 1905 Revolution with a 12 year sentence in Siberia, and his peasant movement was unlikely to have favoured a return to the old days. Another accusation against the peasant movements was that they were kulak-led, dragging the rest of the peasantry in their wake. An analysis of leading lights within the Makhnovist movement at least disproves it in their case. Trotsky implied that the "liquidation of Makhno does not mean the end of the Makhnovschina, which has its roots in the ignorant peasant masses". But all the leading Makhnovists that we have biographical information on came from the poor peasantry, including Makhno himself, and in a few cases the middle peasantry. As Malet says: "the Bolsheviks have totally misconstrued the nature of the Makhno movement. It was not a movement of kulaks, but of a broad mass of the peasants, especially the poor and middle peasants". We have little empirical evidence for the composition of the peasant uprisings in the Don and Kuban areas. Radkey has provided some information on the Tambov insurrection through research under difficult conditions, and has found that Antonov was the son of a small-town artisan - hardly a kulak! There is evidence that some leading Antonovists were of kulak origin, (based on Bolshevik archives) yet one Cheka historian had to admit that a "considerable part of the middle peasantry" supported the insurrection. There is evidence that Antonov had the support of the poor peasantry and some workers in the province. One must have reservations over the allegations of the 'kulak character' of these uprisings. Even if it is admitted that some kulaks took parting the risings, it must be granted, from the little evidence available, that other sections of the peasantry took an active part. What can be made of the allegations that far from being counter-revolutionary, the peasant uprisings were the start of a 'Third Revolution' (leading on from the February and October Revolutions)? This term appears to have been developed by anarchists within the Makhnovist movement, appearing in a declaration of a Makhnovist organ, the Revolutionary Military Soviet, in October 1919. It reappeared during the Kronstadt insurrection. Anatoli Lamanov developed it in the pages of the Kronstadt Izvestia, the journal of the insurgents, of which he was an editor. Lamanov was a leader of the Union of Socialist-Revolutionary Maximalists in Kronstadt, and saw Kronstadt as the beginning of a 'Third Revolution' which would overthrow the "dictatorship of the Communist Party with its Cheka and state capitalism" and transfer all power "to freely elected Soviets" and transform the unions into "free associations of workers, peasants and labouring intelligentsia". The Maximalists, a split from the Socialist-Revolutionaries, demanded immediate agrarian and urban social revolution, a Toilers Republic of federated soviets, anti-parliamentarism and distrust of parties. There is little evidence on the links between them and the Makhnovists, though it would be unlikely that this slogan emerged in two places totally independently. "Here in Kronstadt, has been laid the first stone of the Third Revolution, striking the last fetters from the labouring masses and opening a broad new road for socialist creativity", proclaimed the Kronstadters. The term 'Third Revolution' however, seems vague, with no clear idea of how to bring this Revolution about. It had its adherents in Makhnovist circles, and possibly in West Siberia and with Maslakov, but never operated in a unified approach to a development of its implementation. What distinguished the Makhnovist movement from Tambov was the former's specific ideology. The Antonov movement had no ideology, "knew what they were against... but only the haziest of notions as to how to order Russia in the hour of victory". The Antonovists were a local movement with local perspectives. The Makhnovists were wide-ranging, and links were formed with Maslakov. Makhno himself campaigned as far as the Volga, going around the Don area linking up similar bands. A Makhnovist detachment under Parkhomenko was sent off to the Voronezh area in early March 1921 and it might have been attempting to link up with Antonovist detachments under Kolesnikov. But the vast expanse of the Soviet Union curtailed link-ups between the movements. There seems to have been widespread mutual ignorance of either the existence or the aims of the differing peasant movements. Where there was an awareness, there seems to have been little effort to combine the movements for a unified onslaught against the Bolshevik government. The Kronstadt insurrection was later deemed as several months premature by some of its leading lights. Localism and lack of a more global strategy similarly hamstrung Antonov and the movements in the Don, Kuban and west Siberian regions, as did the very spontaneity of the risings. The Makhnovists may have had a better grasp of the situation, but they failed to unite the opposition, going into alliance once more with the Bolsheviks, despite previous unhappy experiences. Nevertheless, the sum of these risings presented a very grave threat to the regime, forcing it to at least move from War Communism to the New Economic Policy. 2. Izmeniia 1917-20, in Atkinson. 3. L Kritsman, The Heroic Period of the Great Russian Revolution, 1926 in Skirda. 4. Kubanin 'The anti-Soviet peasant movement during the years of civil war (war communism) 1926, in Skirda. 7. Lebeds, quoted by Malet. 10. Sofinov, in Radkey. p106. Mitrany, D. Weidenfeld & Nicholson (1951) Marx and the Peasant. Palij, M. Washington (1976) The Anarchism of Nestor Makhno. Radkey, O. Hoover (1976) The Unknown Civil War in Soviet Russia. Maximoff, G. P. Cienfuegos (1976) The Guillotine at Work. Skirda, A. Paris (1982) Nestor Makhno, Le Cosaque de l'Anarchie. Ferro, M. RKP (1985) The Bolshevik Revolution, A Social History of the Russian Revolution. Getzler, I. Cambridge University Press (1983) Kronstadt 1917-1921, the Fate of a Soviet Democracy. Left Socialist-Revolutionaries - a more radical split from the SRs. An excellent summary of Third Revolution movements. I just wanted to point out one minor mistake. At the beginning of the War Communism section it should read "In the East Ukraine, the Makhnovist movement ..." not West Ukraine. Left-Bank Ukraine could also be used. For information on Makhnovist-Antonov links see Eric Landis' article "Waiting For Makhno: Legitimacy and Context in a Russian Peasant War" Past & Present 183 (2004), pp. 199-236. Hey, thanks for that comment, I have corrected the article. That other article you linked to looks really interesting, it would be great if somebody posted it up to our history section here. I am in process of expanding the Kate Sharpley pamphlet into something a bit more booklet size with added information and analysis. Watch this space.